✔ Eleven-time All-NBA First team. ✔ 60 Points in his final game at age 37. … oh my god, it just goes on and on. He won an Academy Award, for god’s sake. Let’s not forget one of his most amazing SINGULAR accomplishments. On May 3, 2004 Jellybean Jr., maxed out against the Raptors. In a 122-104 victory, Kobe became the second most prolific in-game scorer of all time with an 81 point barrage. He scored 66% of his teams points. The next highest scorer on the Lakers was Kobe’s favorite teammate Smush Parker. To this day, Kobe still shits on Smush. Leave Smush alone!!! 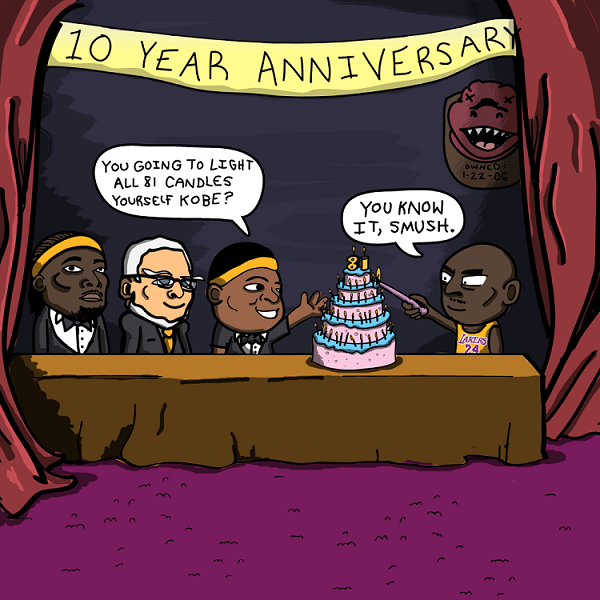 On the 10th Anniversary of this personal record, Smush threw a party for Kobe with a five-tiered Wedding-style, pink frosted cake. Kwame Brown appeared and sat in the corner and Kobe lit all 81 candles himself. Who actually ever needs help, anyway?